Nearly 550 junior tennis players comprising over 70 different teams traveled to Indianapolis Aug. 2-4 to compete in the 2013 USTA Jr. Team Tennis Midwest Section Championships, one of the largest junior tennis events in the country. Teams from all five states in the Midwest Section competed in the following divisions: 18 and Under (ages 15-18), 14 and Under (ages 13-14), 12 and Under (ages 11-12) and 10 and Under. Each division includes both Intermediate level (those new to the sport) and Advanced level players. Competition for all teams took place Aug. 2 and 3, with the finals taking place Sunday, Aug. 4. Winners in the 14 and Under and 18 and Under divisions advance to the 2013 USTA Jr. Team Tennis National Championships which will take place in South Carolina Oct. 17-20 (14 and Under) and Oct. 24-27 (18 and Under). Teams participating in the USTA Jr. Team Tennis Midwest Section Championships advanced by winning their district playoff or dominating their local league. 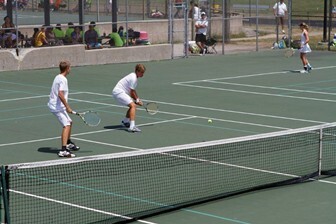 Team matches consist of one set each of boys’ and girls’ singles, boys’ and girls’ doubles, and two sets of mixed doubles. Mixed scoring is based on cumulative games won.